With these high winds lately, we feel the air leaks blowing through cracks in our homes and businesses. In taller homes and buildings these leaks can happen even with no wind. This phenomenon is caused by the “stack effect” which happens when warm air rises causing the warm air to escape through cracks and seams into the attic and out the upstairs windows and walls. When this happens, the warm air escaping upstairs will pull cold air into the building from the basement or lower floor through gaps in the walls, windows and doors. Because of this “stack effect” it is most important to seal all leaks into the attic and around upstairs windows and walls. Second most important is to seal the leaks at in the walls, windows and doors in the lowest floor or basement. When the wind blows, we can feel the cold air coming into the building but otherwise we only notice that it is cooler in these areas. If there is no wind, it is hard to locate the areas of air infiltration. If needed, we will use fans to blow from the inside to the outside. This causes a negative pressure inside the building which will draw air in through cracks and openings. 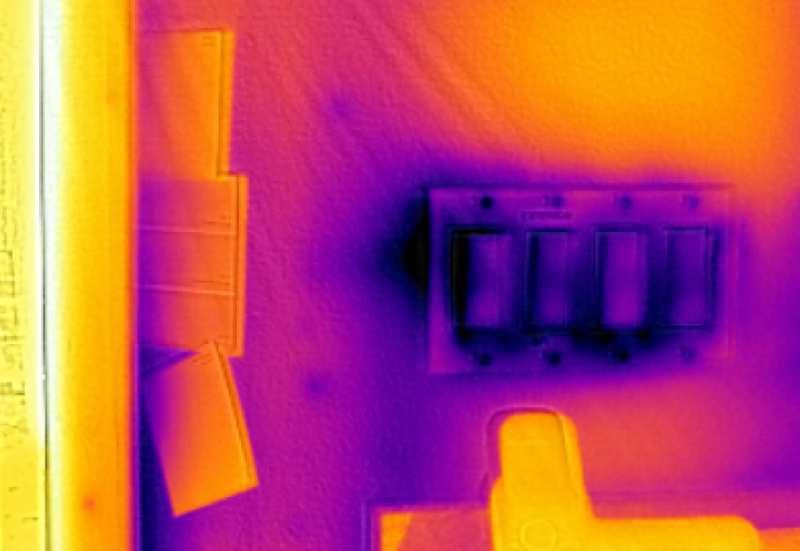 With the infrared camera we will be able to detect where the cool air comes into the home or building. Also an effective method is setting the fan so it blows form the outside to the inside of the home or building. This way we can go outside and use the infrared camera to locate where the warm air is escaping. We feel this is a good method to detect places that need caulking on the outside of the home or building. Cold damp air entering into the home or building that goes into the wall cavities can cause condensation inside your walls. This condensation can cause many problems such as dry rot of the framing materials and enabling mold spores to get a foothold inside your walls. These problems, if left alone, can cause expensive repairs to the home or business. In most cases, we can do an infrared inspection to detect air leaks in about two hours. 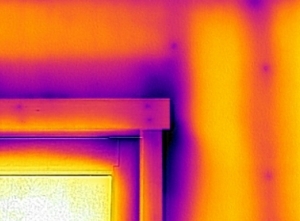 This makes the locating and fixing of these air leaks a fairly quick job, often paying for the job in a short time from the money saved by lower fuel bills in the winter and summer. I have been in the construction trade for 35+ years. My company name is Tyler Coastal Construction & Design Inc. I have a DBA company called Western Infrared.